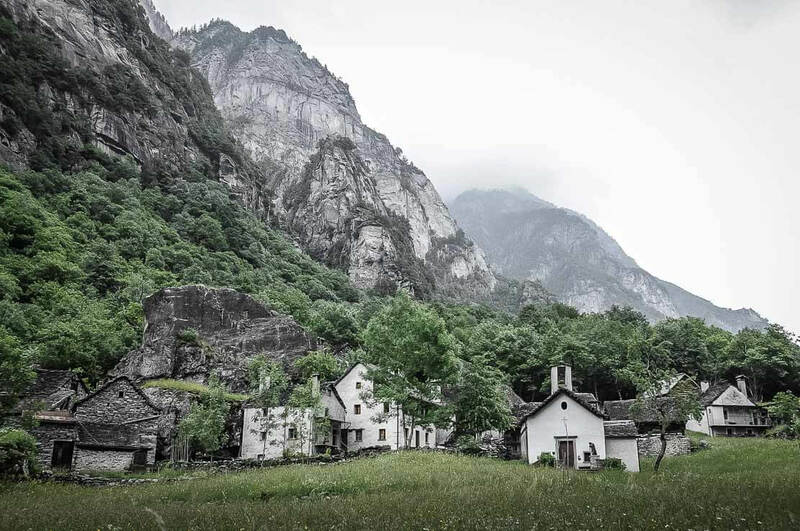 Easy hike in the beautiful Val Bavona, narrow, rocky and wild, located in the canton of Ticino in Switzerland. 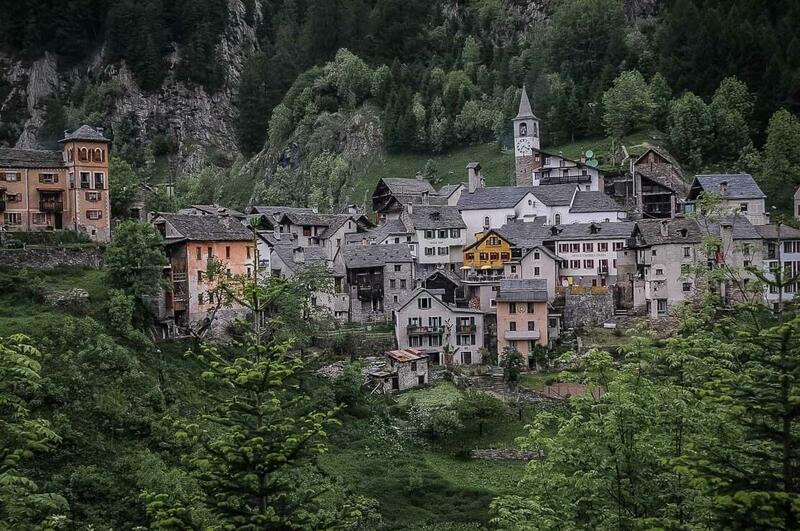 Roam through Val Lavizzara with its famous church by Mario Botta. 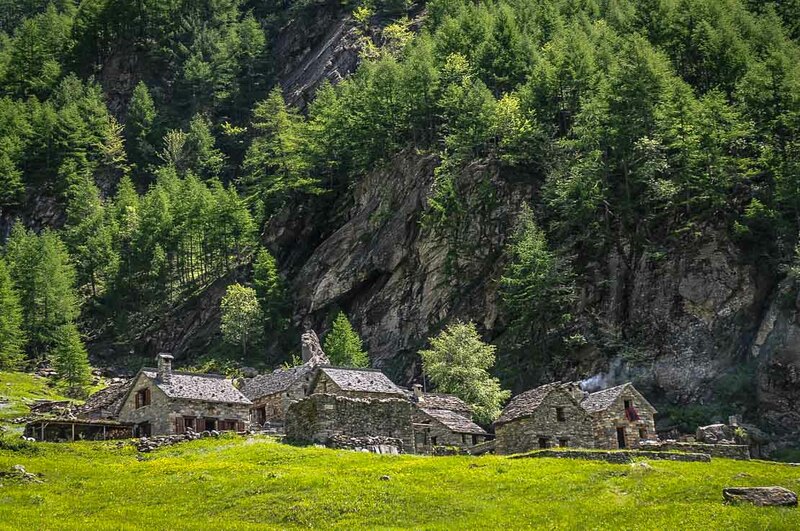 Discover charming and picturesque villages with its ancient traditional Ticino stone houses before reaching the Basodino hut with the panoramic view of the famous Robiei glacier. The banks of its lake have a Mediterranean climate, and it’s almost unreal to see so many palm trees here in Switzerland. 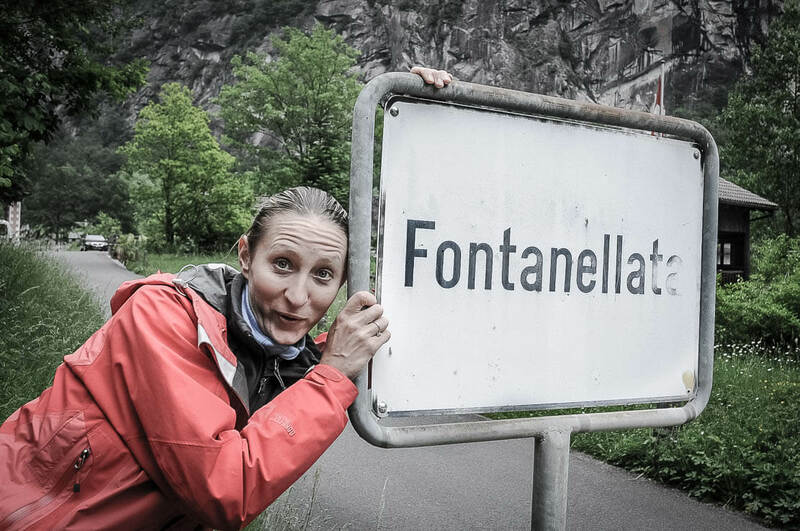 The language of this canton is the Swiss-Italian but almost every village has its own dialect. Going to Ticino is a bit like going on holiday in the sun. 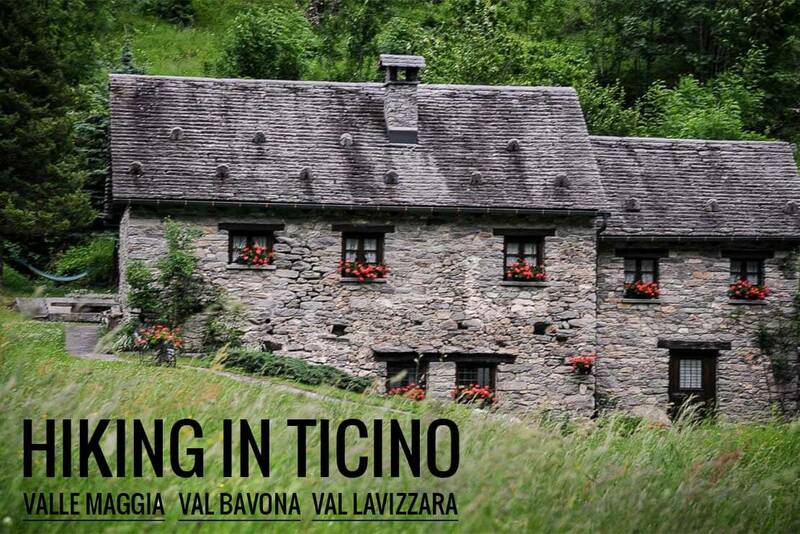 We visited several cities in Ticino on previous occasions, however, this time we decided to go hiking in Ticino. 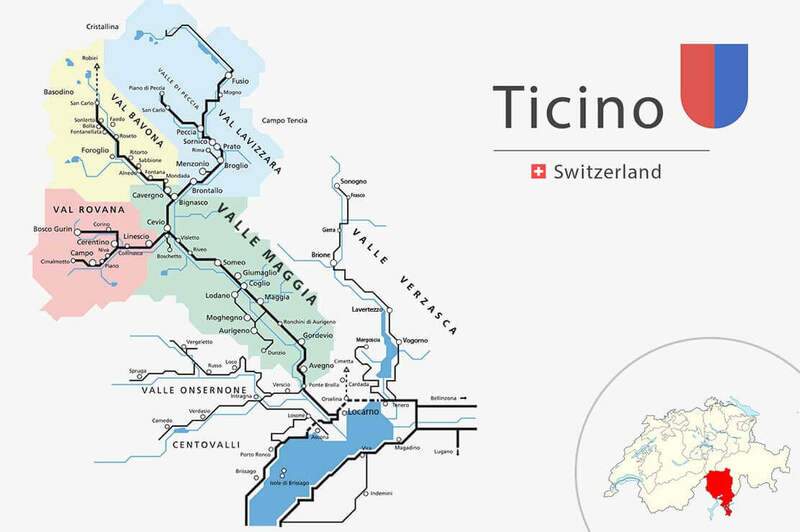 Despite a very short distance on the map, it took us about 6 hours to reach Ticino from Geneva. Our trip starts with a stop at Locarno. Sun, palm trees and film festival – that’s what comes to our mind when we say Locarno. 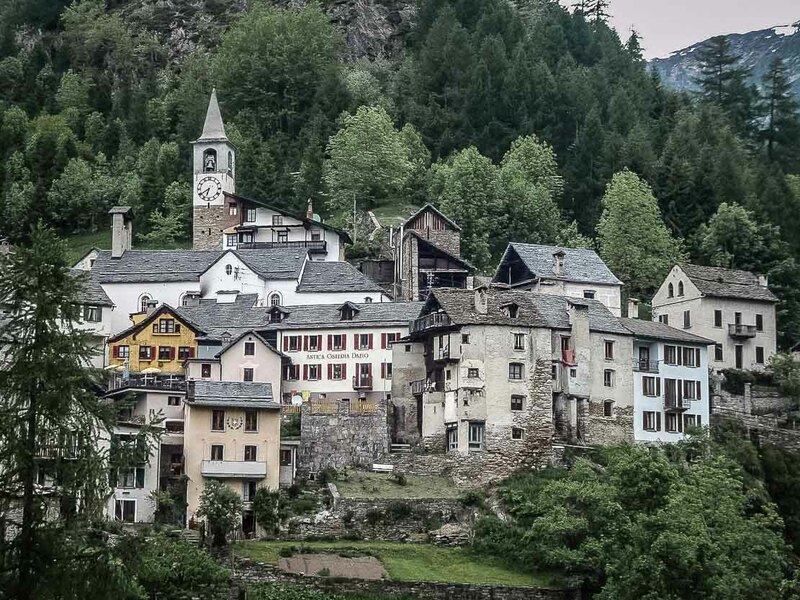 This pretty town in Ticino, situated on the banks of Lake Maggiore, is proud to have the mildest climate in Switzerland. After the drive in one go between Geneva and Locarno, we have a pleasure of having a glass of good Merlot on Piazza Grande, known for its nightly open-air screenings during the famous Film Festival, which takes place every year in August. 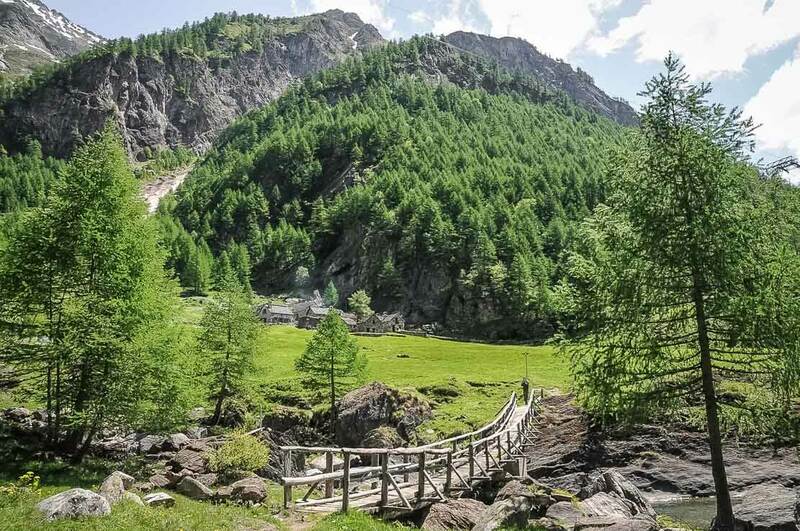 We visit the center of Locarno and the lake but we don’t linger as our final destination is in the mountains, Val Bavona via Maggia with a detour on Val Lavizzara. Along the way we see the sign “Grotto”. Errol is, of course, very excited to visit the caves! And we are already imagining grandiose stalagmites and stalactites, narrow passageways and underground rivers. Following the path we come to … a restaurant. Moment of silence … We knew it, or lets at least pretend it, but we had completely forgotten that small traditional restaurants are called “grotto” in Ticino. 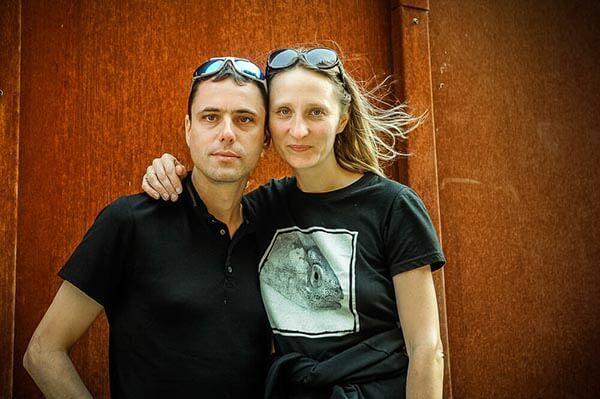 Olga is thrilled! She doesn’t want to leave without trying a local specialty. It’s nice to eat around a beautiful table made from stone, with benches carved from a single block of rock. We eat risotto and polenta with rabbit, all washed down with a glass of merlot, grape variety from Ticino. 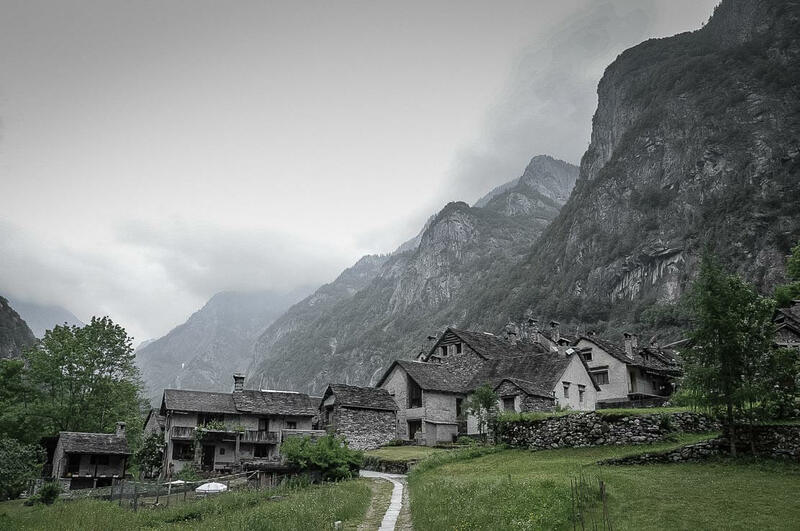 After a very good meal, we hit the road again for hiking in Ticino villages and mountains. We arrive in Bignasco. 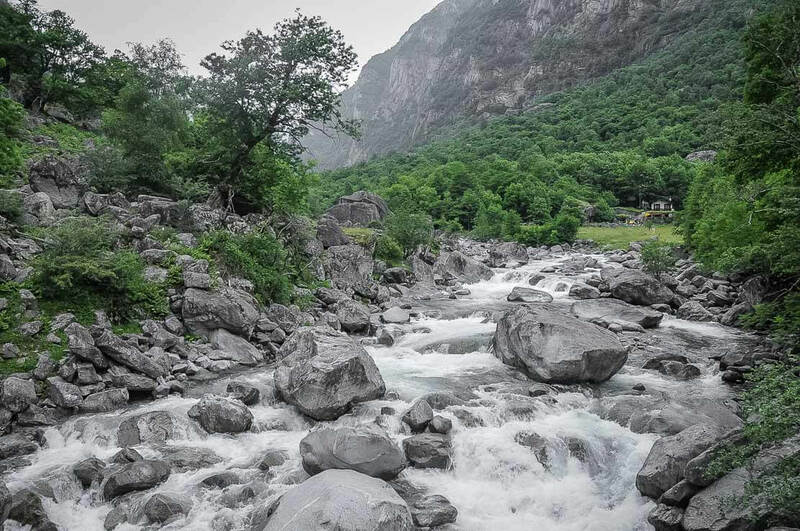 The Valle Maggia is divided here into two valleys, the Val Bavona and Val Lavizzara. 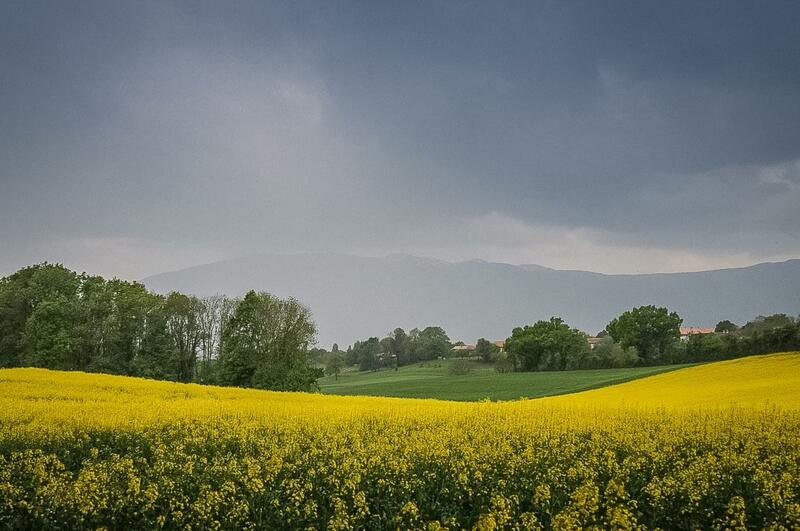 We continue on the Val Lavizzara towards Fusio to explore its villages of stone and its surroundings. 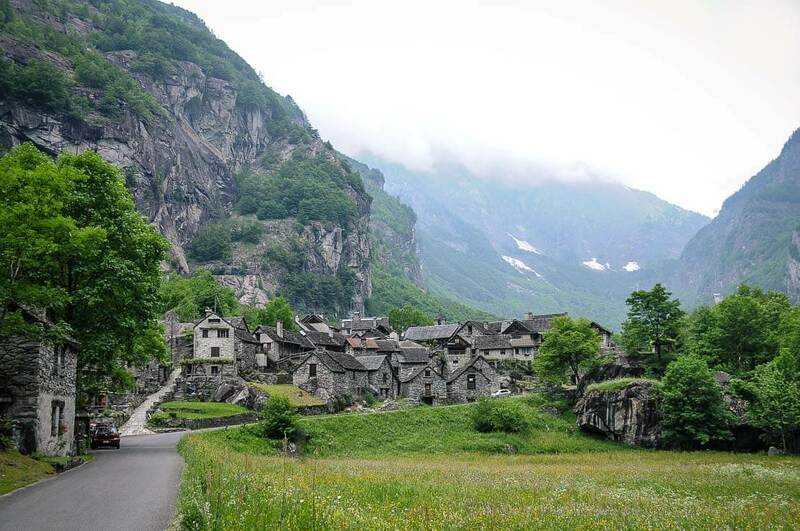 We drive on a road with extremely tight switchbacks through the typical villages of Brontallo, Menzonio, Broglio, Prato, and Peccia, and finally Mogno and Fusio. 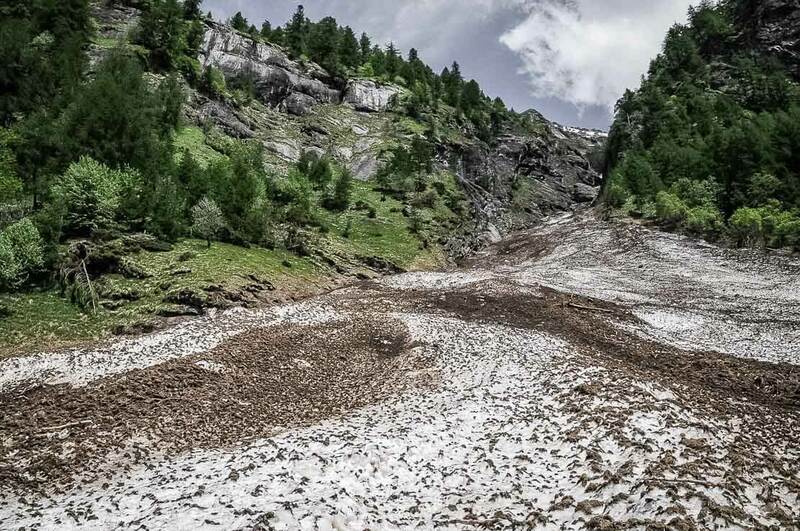 In 1986, an avalanche destroyed part of the village, including the church the dating back to 1638. There were no casualties as the village was gradually abandoned due to the recurrent flooding and landslides. 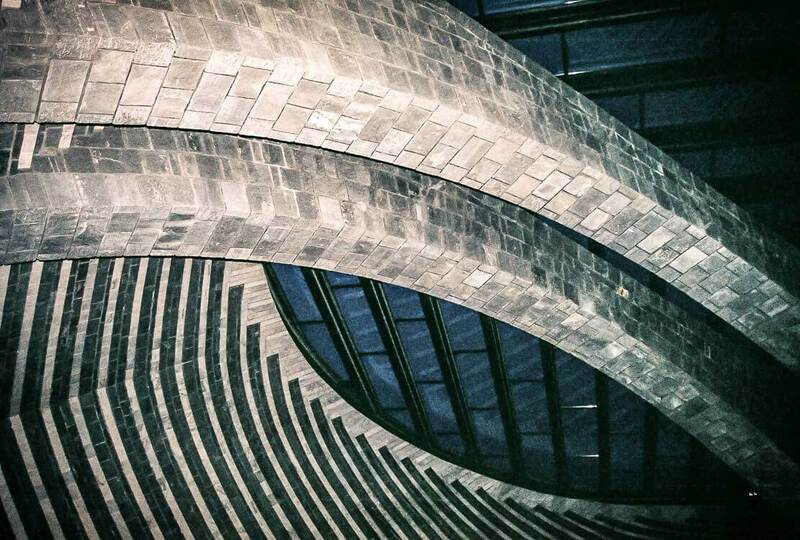 The church, Chiesa di San Giovanni Battista, was rebuilt in two years and completed in 1996 by the famous architect Mario Botta. 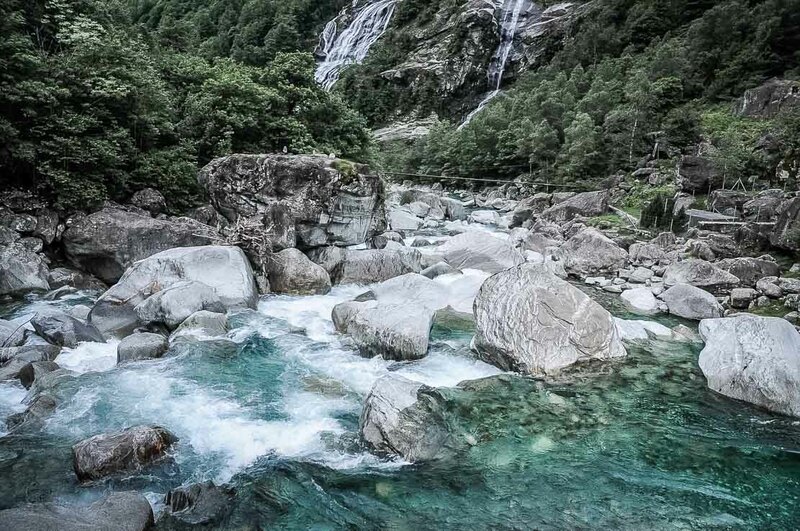 It consists of checkerboard patterns made of dark and light stones, the strata alternating marble of Peccia and granite from Valle Maggia. The church has no windows, light enters through the glass roof. This church, initially a controversial project, is now considered an architectural masterpiece and has gained an international reputation. 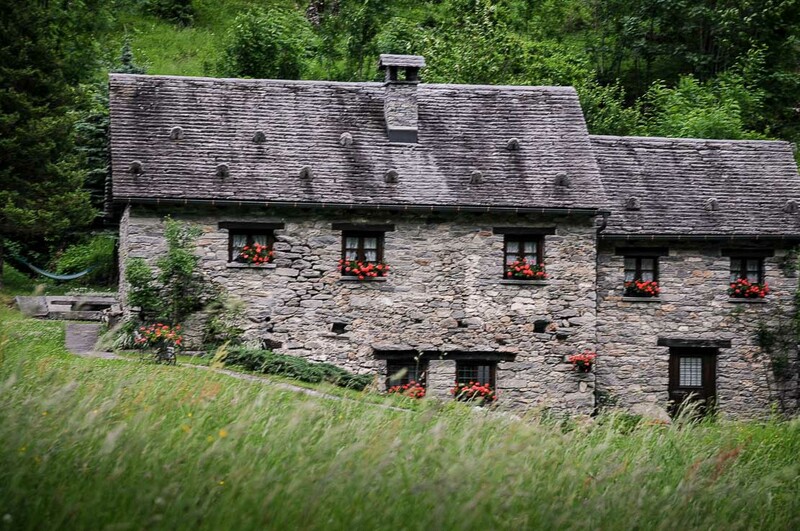 The majority of the houses of the hamlet of Mogno have been restored but they all retain a traditional Ticino look. 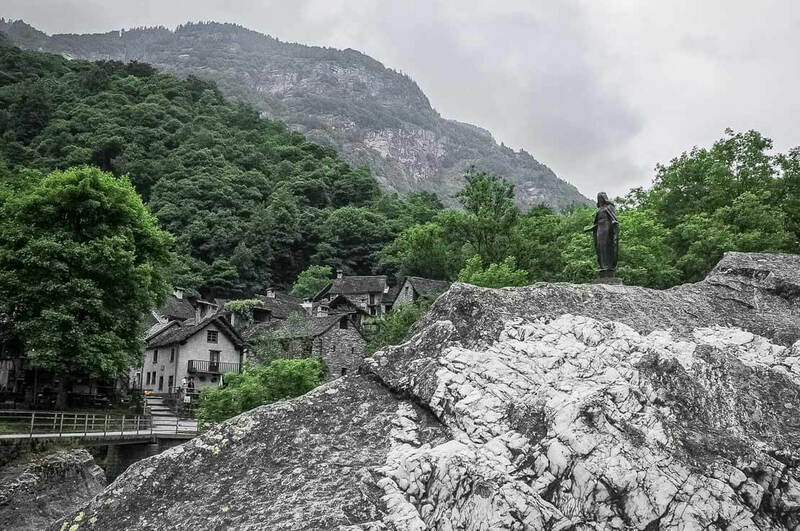 We decide to spend a night in Fusio to explore its surroundings and take a short hike to the artificial lake of Sambuco. 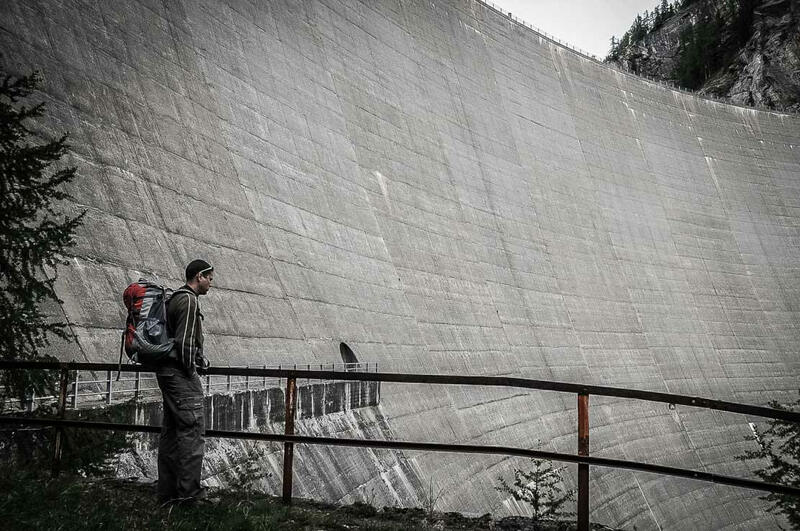 It’s always impressive, a dam in the Alps. 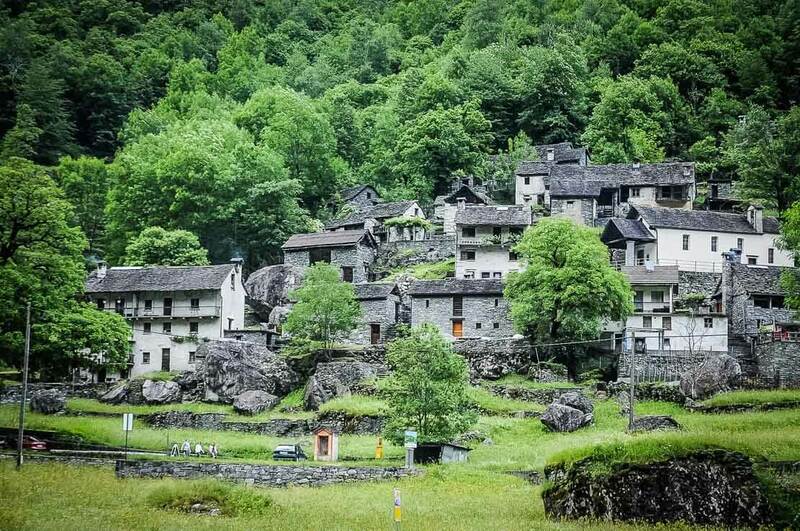 Fusio is a small hamlet situated at the end of the valley Lavizzara at 1’280m of altitude, 45km from Locarno. 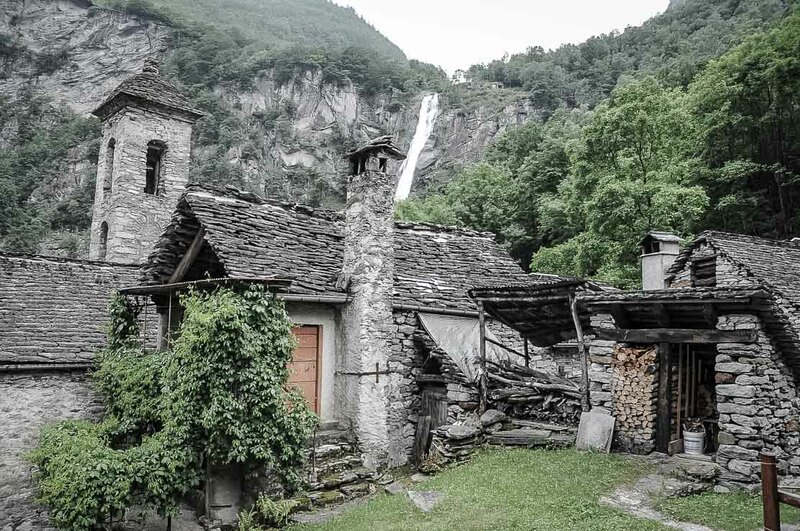 Here, one can see old buildings of stone and wood, with “scandole” roof (rectangular boards of larch or fir), which can still be found on some buildings. We retrun to Bignasco, where we leave our car to continue on foot to the Basodino hut. 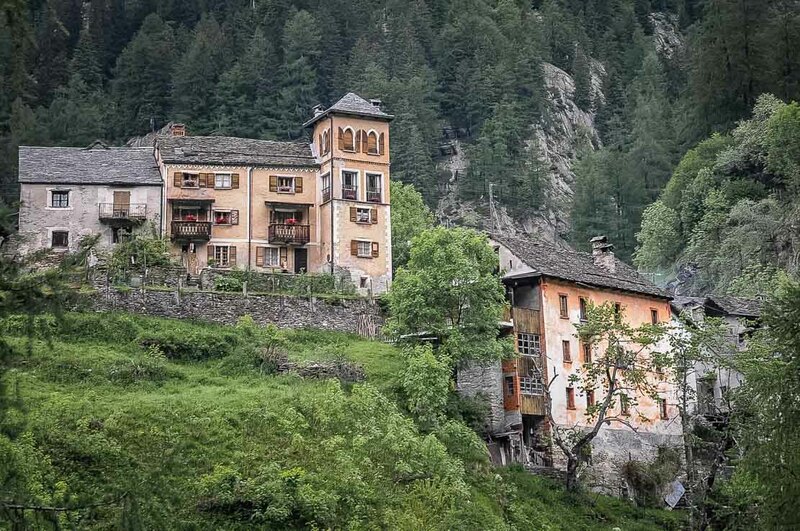 We visit the village of Bignasco, where we marvel at its historic buildings dating back to two or three centuries. 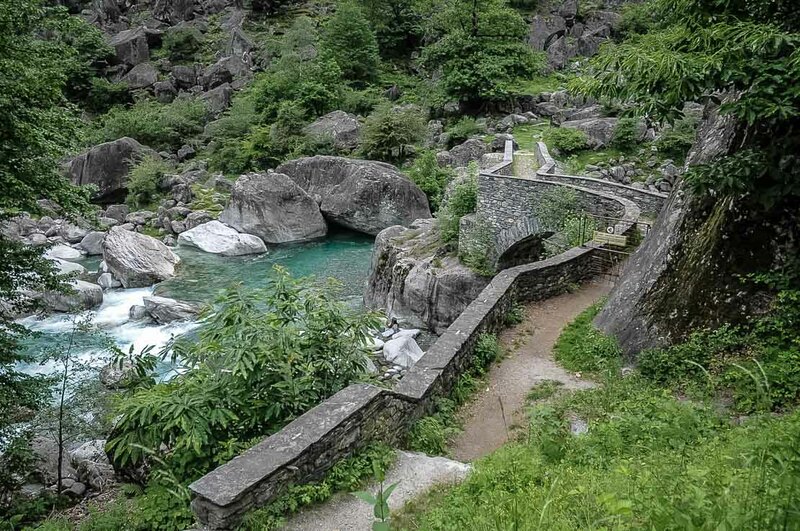 In addition to the houses, there is a beautiful stone bridge, church, chapels, and old granaries on stilts. 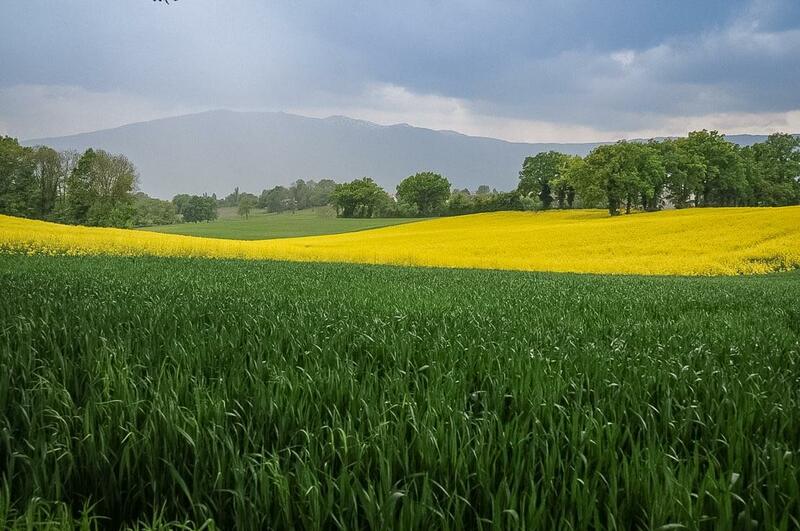 We continue our walk through the villages of Cavergno, Mondada, Fontana, and Sabbione. 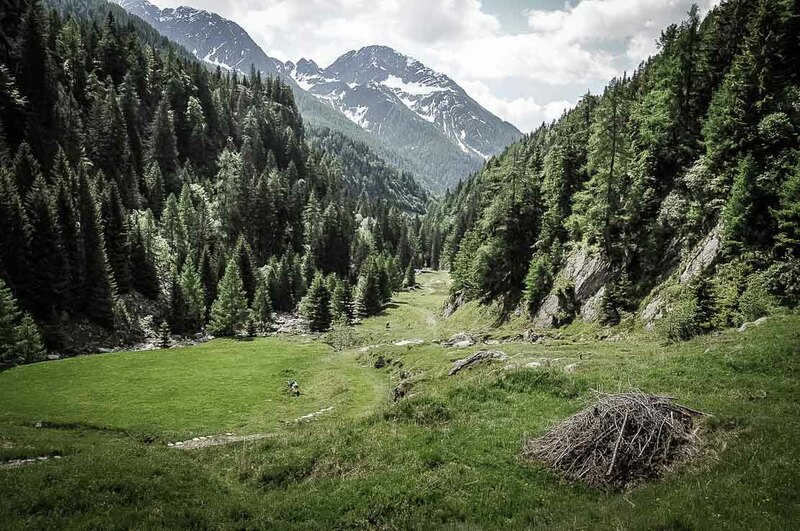 We walk through the forests of chestnut, once considered the tree of life for its fundamental importance for subsistence in Ticino. The path from Bignasco to Foroglio, very rocky, is called “Sentiera della pietra” or “Stone trail”. 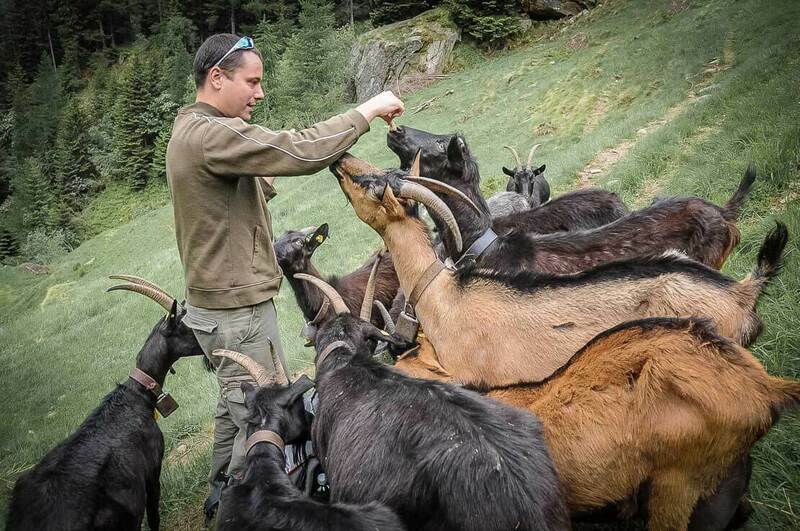 We encounter a lot of cows and goats along the way. 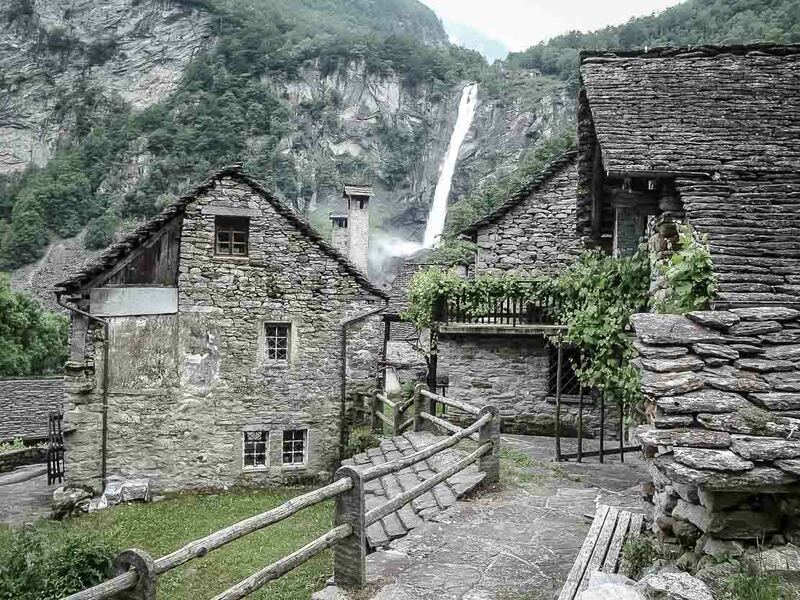 Hiking in Ticino often includes walking through picturesque villages with traditional stone houses, water cascades and green pastures. 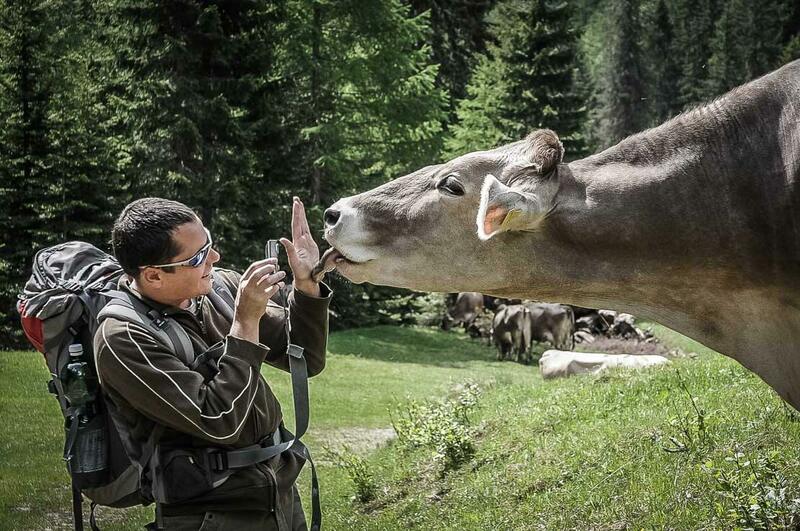 The hike goes through the twelve villages of the Val Bavona scattered along the 12km. 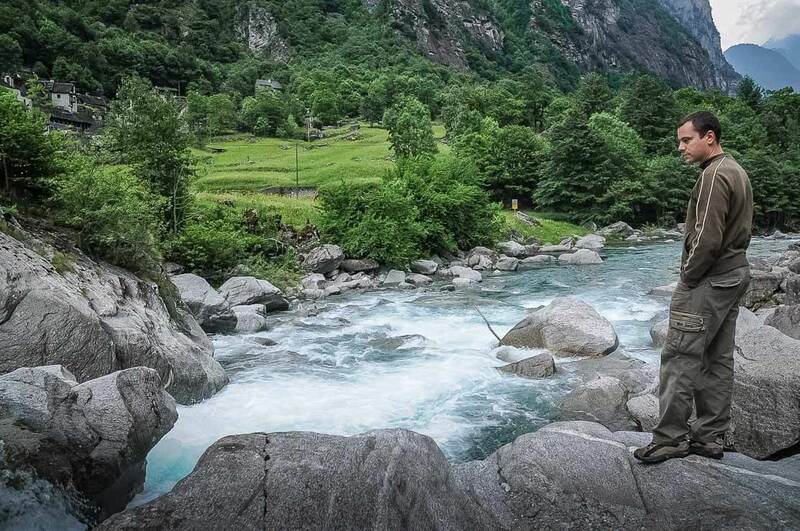 Val Bavona, coming from Valle Maggia, is a beautiful valley of Ticino, narrow, rocky, and wild. Even today, many houses in the valley remain without electricity and use solar panels for energy. 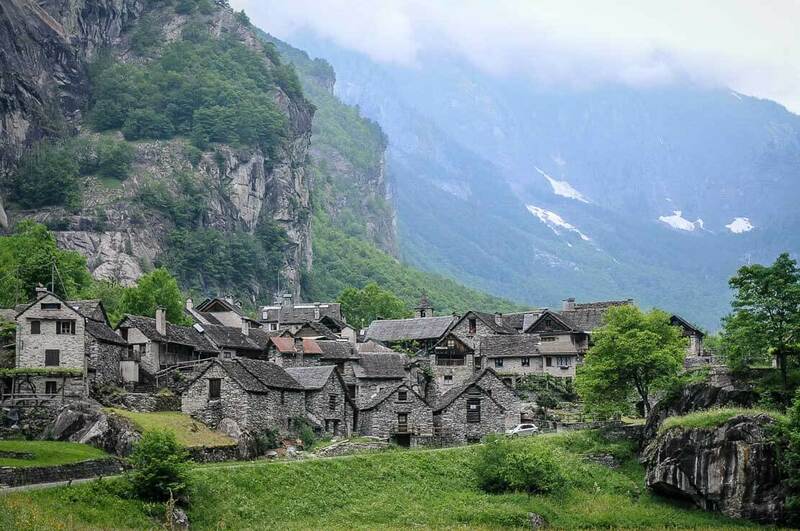 The twelve small typical villages of Val Bavona are all charming and picturesque. 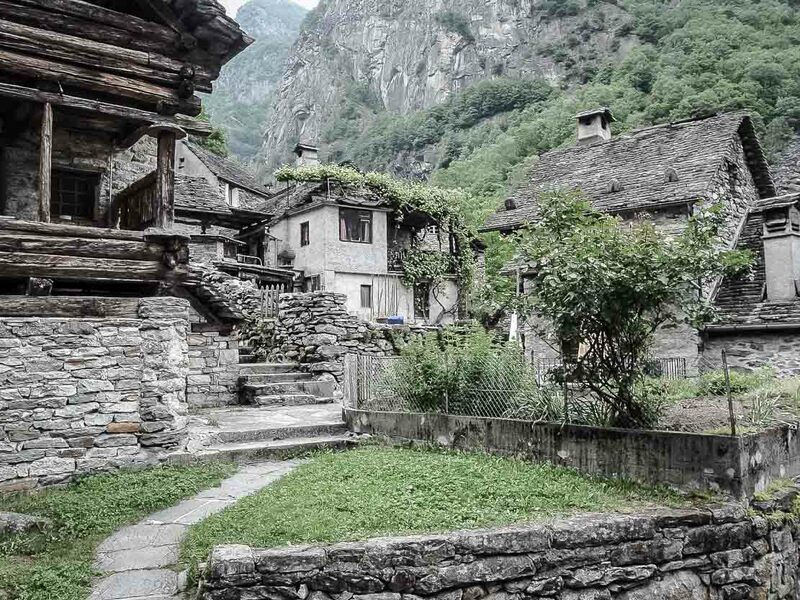 Most of the houses, made of stone and called “rustici”, were built 300-400 years ago. Many of these “rustici” have been modernized and are available for rent. With a few exceptions, most of these houses are inhabited only during the summer. Val Bavona is located between high cliffs that dominate the valley. Locals built some of their houses in rock cavities or using the space between very large rocks and closing the space with the help of smaller stones. These houses are called “sprügh” or “splüi”. 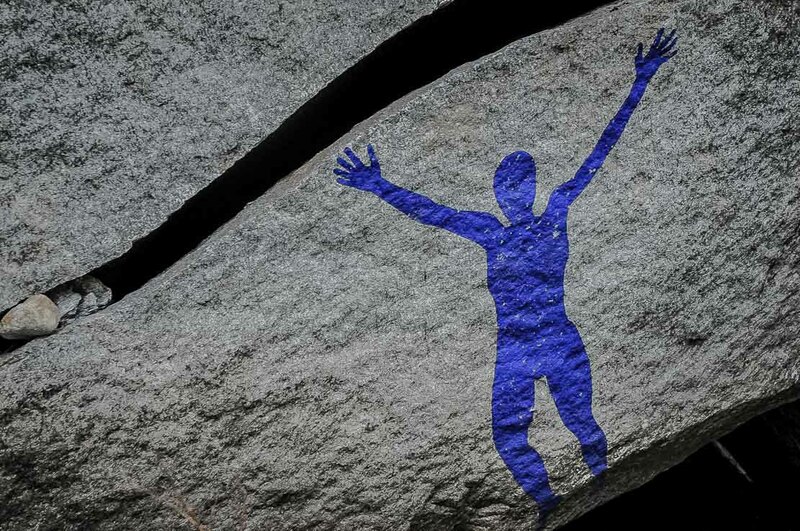 Val Bavona offers a very impressive mineral spectacle. Most of the large boulders found along the hiking trail have detached from the cliffs to finish their improbable run along the valley. 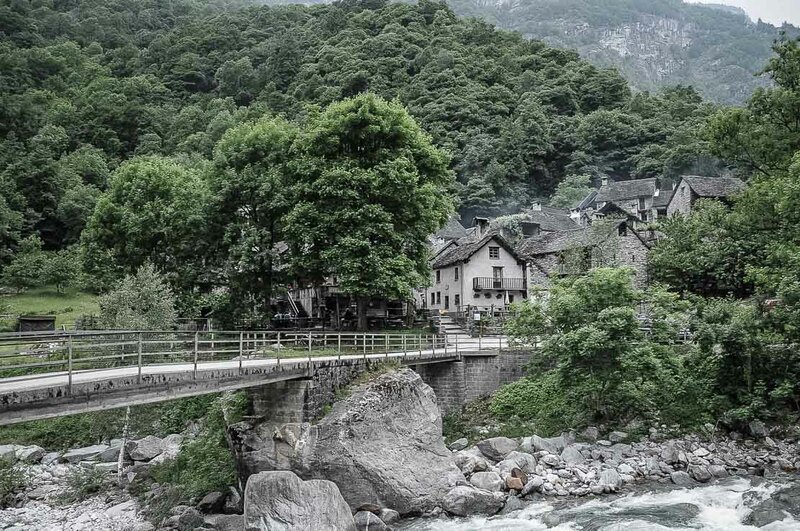 We arrive at Foroglio, a small picturesque village with a beautiful water cascade of 80m high. The village is concentrated around a church surrounded by old traditional houses built of stone and wood, called “torba”. Here you will find the excellent restaurant Grotto Froda with a view of the waterfall. We pass by the village of Sonlerto, which is quite special. People here have developed an ingenious system to cultivate their gardens by placing the soil on flat surface of boulders in order to save land for pastures as the arable land in the region was scarce. It also protected the gardens from goats. 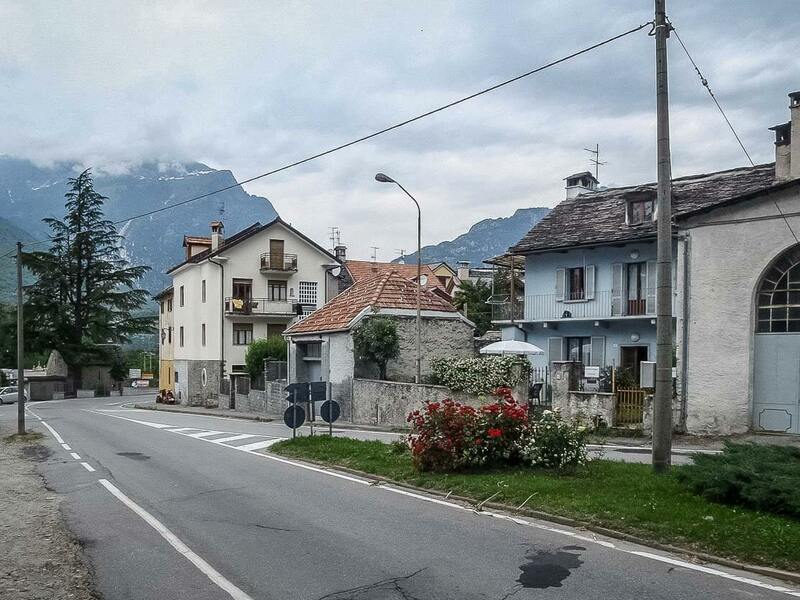 We arrive at San Carlo, the last village of the Val Bavona. 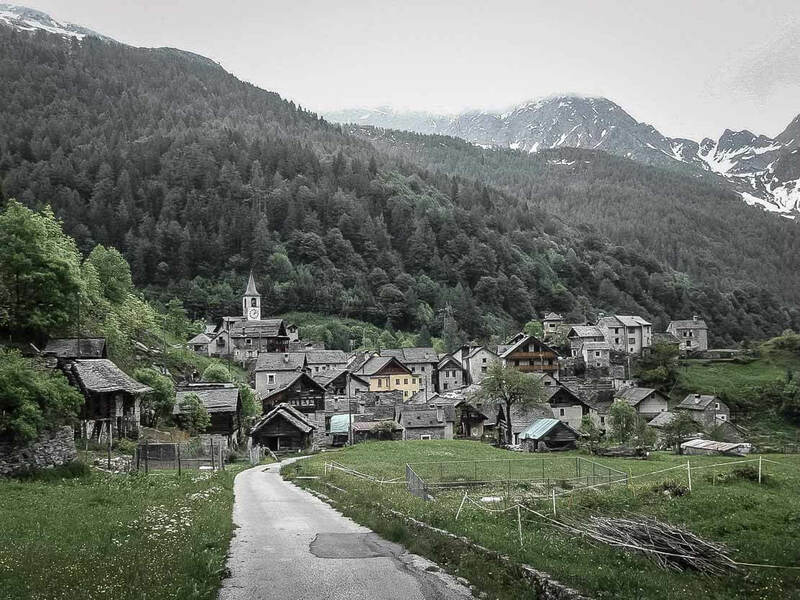 The San Carlo houses aren’t situated close to each other but rather scattered as the village was created during the time when people spent their winter outside the valley and didn’t need to live close to each other. San Carlo is the starting point of the cable car up to Robièi at 1’900m of altitude. But as we are in May and the cable car is still closed at this time of year, we go up on foot (the cable car is open from June to October). 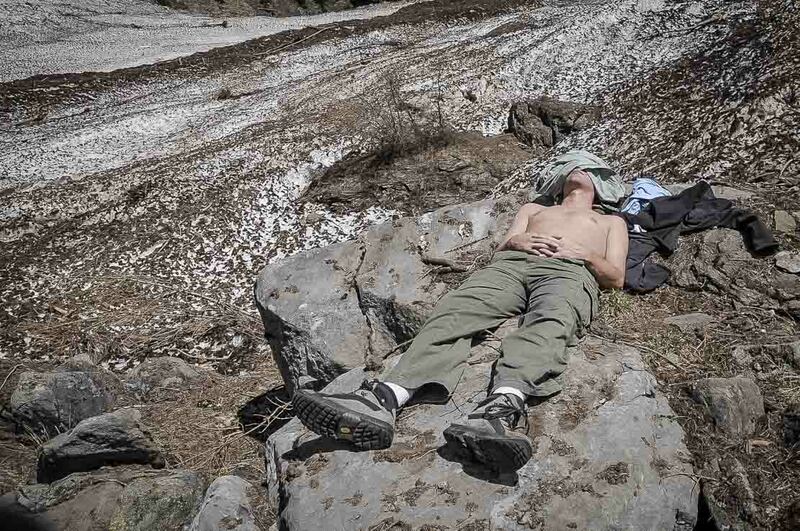 A very easy hike in the beginning becomes a quite difficult one as the snow hasn’t completely melted. We are in the spring, and the path is not marked yet. With some small difficulties we finally reach the hut. 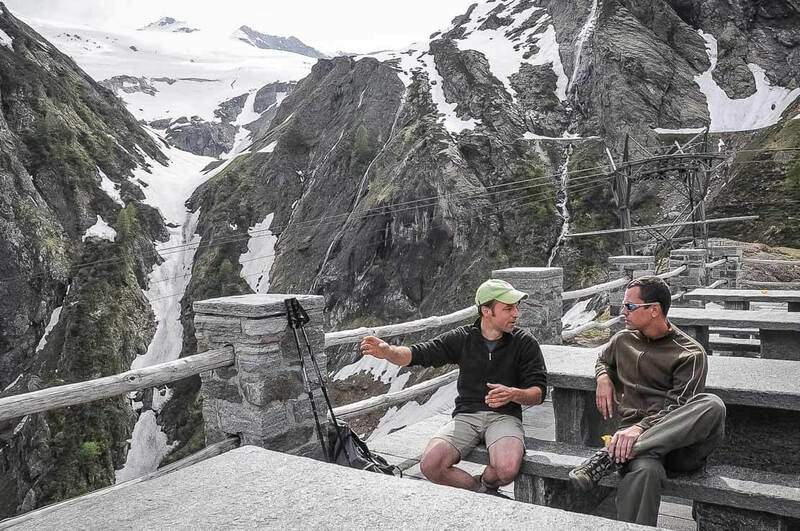 The Basodino hut (built in 1927 and renovated in 1992) has a beautiful terrace overlooking the Basòdino, a mountain with its famous Robiei glacier. Unfortunately, it’s disappearing very quickly, to the point that some experts consider its fate inevitable. Basodino, where hunting is prohibited, is home to many wild animals. 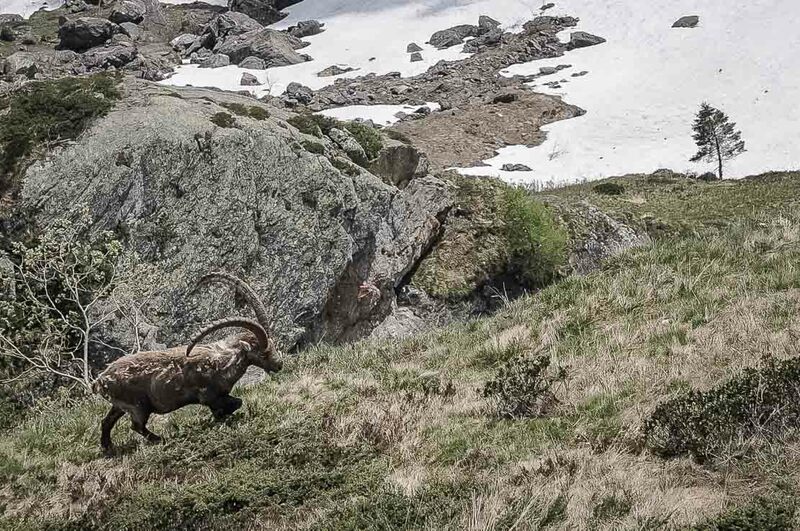 We have a chance to see some ibex and chamois. For marmots, it will be for another time – it’s still too cold to see them coming out or simply we were not that lucky this time. 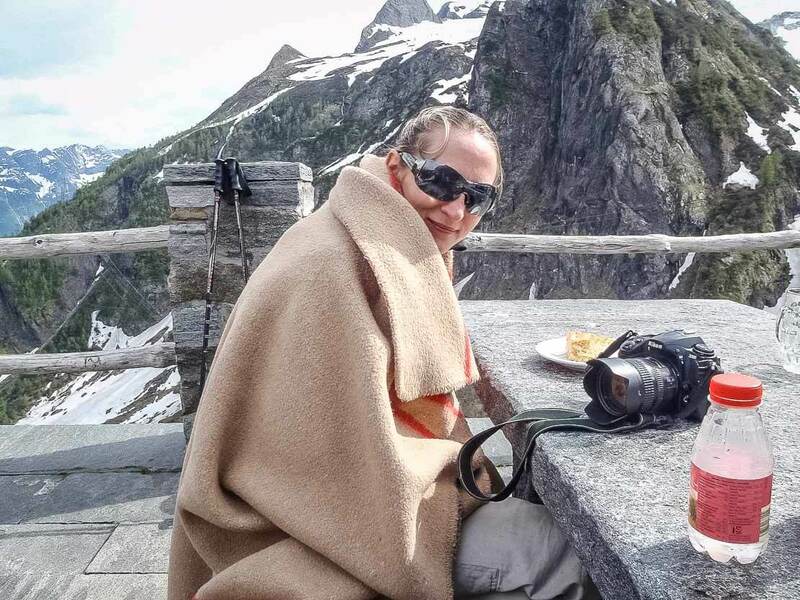 Hike in Switzerland isn’t complete without a glass of wine on the top of the mountain. After a well-deserved rest and a drink on the terrace , we go down the valley. 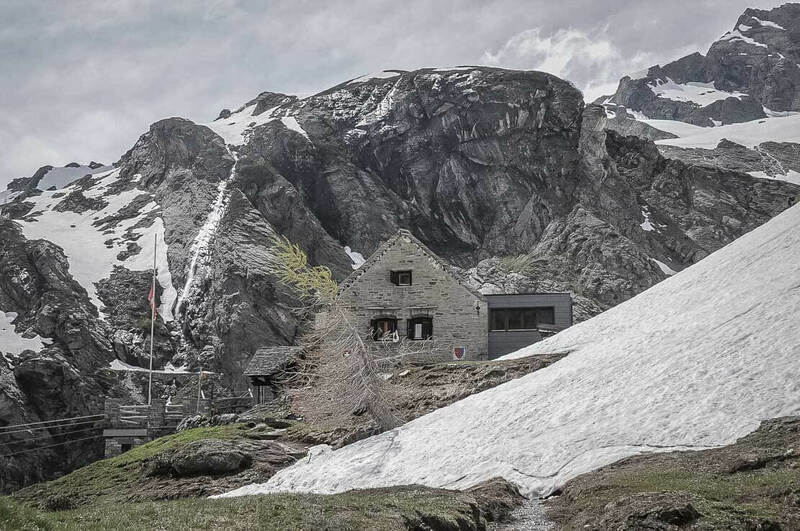 Location: The Basodino hut is located in the canton Ticino in Switzerland. 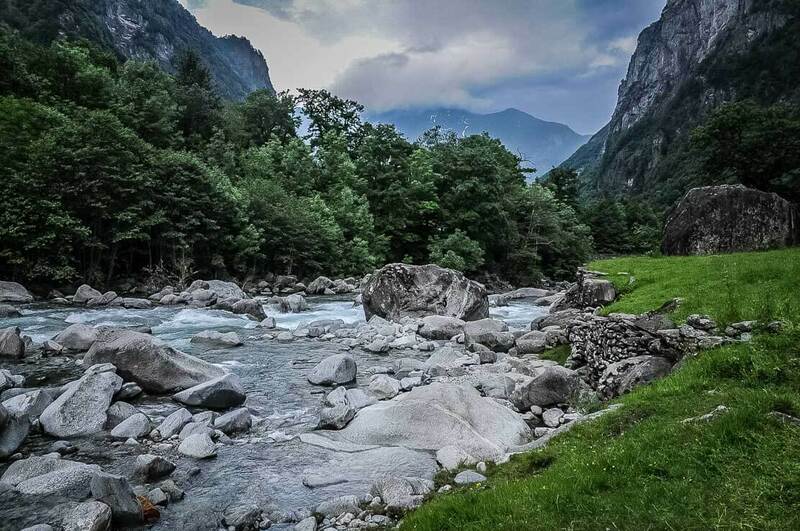 It lies at 1’856m of altitude in Val Bavona-Robiei above Valle Maggia. 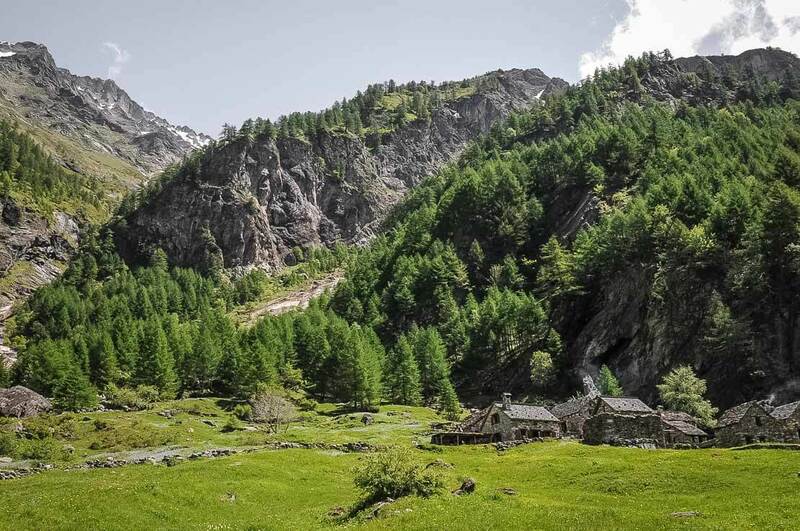 The hut is directly accessible from San Carlo by foot and cable car (open from June to October) or by hiking from Bignasco. Hiking from Bignasco to San Carlo is very easy: T1 (easy hiking), 12km, with 820m altitude difference. 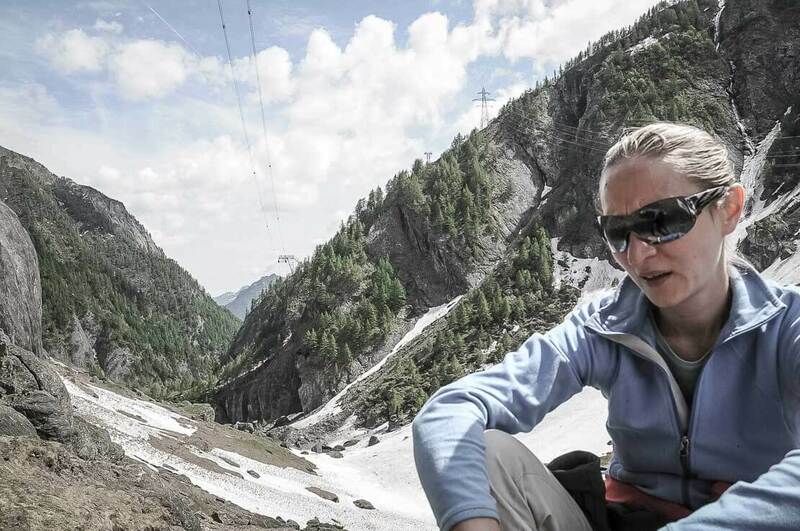 Hiking from San Carlo to the Basodino hut is fairly easy: T2 (medium, mountain hiking), 5km, with 918m altitude difference. 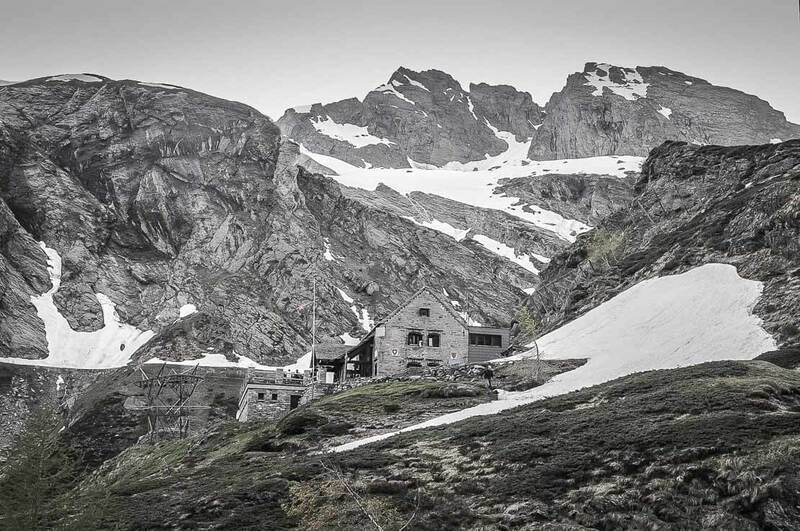 The hut is open all year round but guarded only in summer (June – October). Hiking from Bignasco on the summer trail is from May to October. 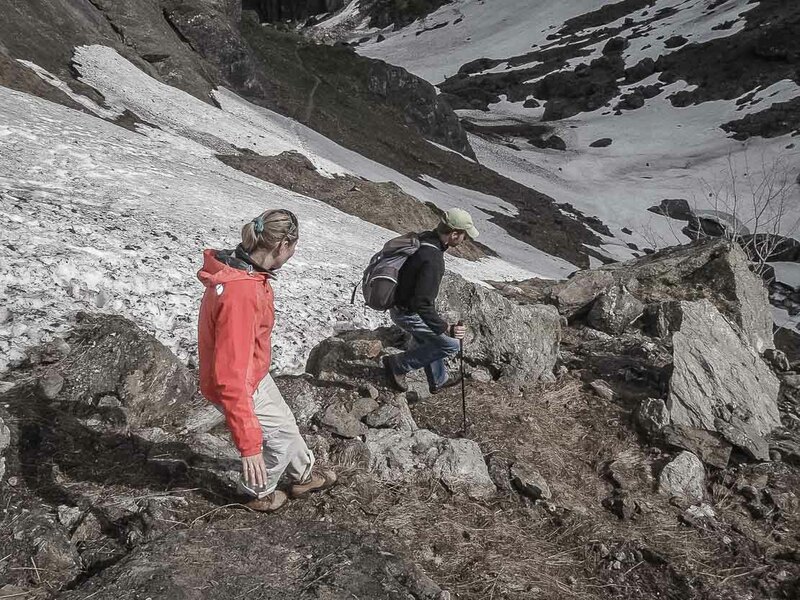 Hut belongs to the Swiss Alpine Club (SAC), offering a discount to its members. 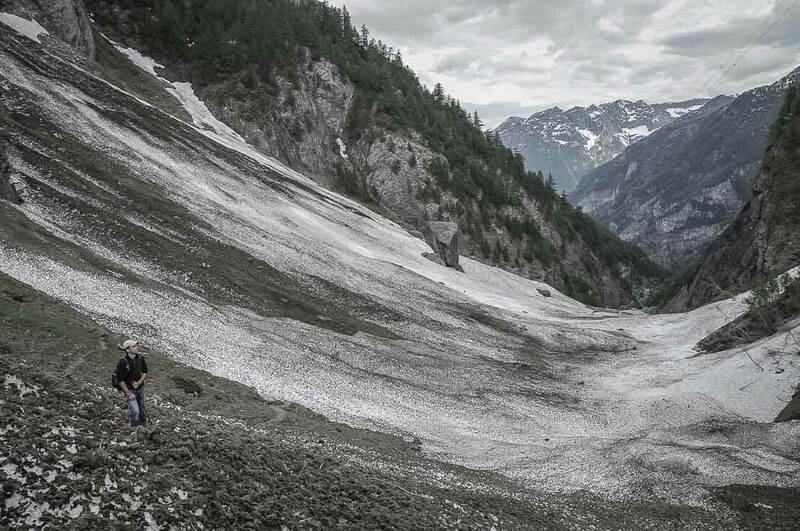 Additional information: It’s possible to continue the hike from the hut to the Basodino glacier, Val Formazza (Italy), various mountain lakes (Lago di Robièi, Nero, Bianco, etc. ), or towards Val Bedretto through the Passo di Cristallina (Cristallina Pass) at 2’568m of altitude.